For any contractor who offers insulation and roofing services, using the right spray foam guns can help improve quality, productivity, and profitability. For many seasoned professionals in a variety of industries, Graco has been the manufacturer of choice since 1926. Why Choose Graco Spray Foam and Polyurea Guns? Simple to operate and designed to minimize downtime. Meticulously engineered to offer great quality and durability at a reasonable price. Enhanced spraying capability and precision helps increase productivity without sacrificing quality. Versatility thanks to the ability to mix and match a variety of parts (e.g., spray tips and mix chambers) for applying different materials based on the needs of each job. Easy maintenance and minimal cleaning time mean you can spend more time getting the job done. Designed to withstand extended periods of usage without getting clogged. Ergonomic, light-weight design is comfortable to use for a prolonged period. Fusion AP Series: considered one of the easiest spray foam guns to use by seasoned contractors, the Fusion AP series is designed to increase productivity, reduce downtime, and make maintenance a breeze. 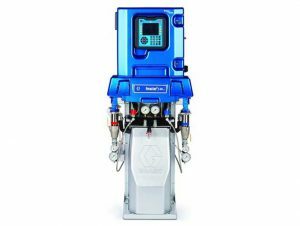 Fusion CS Series: with Graco’s innovative Clear Shot technology, the Fusion CS spray foam guns produce better spray quality results while minimizing maintenance time, so you can maximize productivity. Probler P2 Series: the easy-to-use Probler 2 is the ideal plural component, air purge gun for spray polyurethane foam and polyurea applications. Its light-weight design allows you to move around job sites comfortably and efficiently. GX7 Series: plural component, mechanical purge guns that are dependable even in the toughest job site conditions. D-Gun: a plural component spray gun designed for small to medium applications such as interior stud wall spraying. Its wide variety of mixing chamber allows you to fine-tune spraying pattern while the self-cleaning mechanism saves you time and money. When buying spray foam and polyurea guns for your contracting business, you should consider more than price and product selection. For example, you may save some money by purchasing from a big distributor. However, your job could be held up for days when you can’t get the right replacement parts or the proper support, causing substantial losses in income and productivity. Accessibility: Time is of the essence when you need a replacement part to minimize the loss in productivity. Intech has a national footprint that allows us to get you the parts you need and provide on-site technical support within 24 hours. Customer Support: Intech offers same day or next day customer service either on phone or in person no matter where you’re located in the country to ensure that your jobs don’t get held up by technical issues. Flexibility: Unlike most distributors, Intech doesn’t tie the purchase of spray foam materials to the purchase of the equipment. That means you can use any material that is most cost-efficient for your job and maintain a healthy profit margin. Training and Troubleshooting Assistance: Intech customers have access to our experts who are available to provide training and assist in troubleshooting, so you can get the most out of the equipment and supplies you have purchased. Warranty: When you have issues with a piece of equipment you bought from Intech, you can get it fixed right away without going through any red tape with the OEM. You can bring the equipment to our locations, have our customer service team walk you through a fix over the phone, or request a tech specialist to be sent to your location within a day. Dependability: Intech has been in business for 20 years and is trusted by many professionals to fix or replace their equipment efficiently. When you purchase from us, you know you can get the assistance you need whenever and wherever you need it. Intech Equipment has been a Graco Top 20 North American Distributor since 2010. We not only supply professionals with the highest-quality equipment but we also make sure you get all the support you need to succeed. Learn more about our collection of Graco spray foam and polyurea guns here.